The destruction of an exoplanet may sound like something that came straight from Sci-Fi scenario, but, earlier this week, researchers — using several telescopes, including Chandra X-ray Observatory — have found evidence that a white dwarf star may have been a planet-killer obliterated an entire world that ventured nearby. A white dwarf star is a star that’s burned up all of the hydrogen once used as nuclear fuel. White dwarfs are extremely small, about the size of Earth, and incredibly dense, its mass is comparable to that of the Sun. So, could a white dwarf destroy a planet? Once a star hits its white dwarf stage, practically all their matter packed into a radius a hundredth of their original size, as a result, its gravitational pull become extremely strong — more than 10,000 times stronger than the pull on the surface of our sun. This means that, when a planet passes too closely to this type of dying star, it can be ripped to shreds due to the intense gravitational tidal forces. In this research, astronomers used the ESA‘s INTErnational Gamma-Ray Astrophysics Laboratory (INTEGRAL) to discover a new X-ray source near the center of a globular cluster called NGC 6388 in the Milky Way. 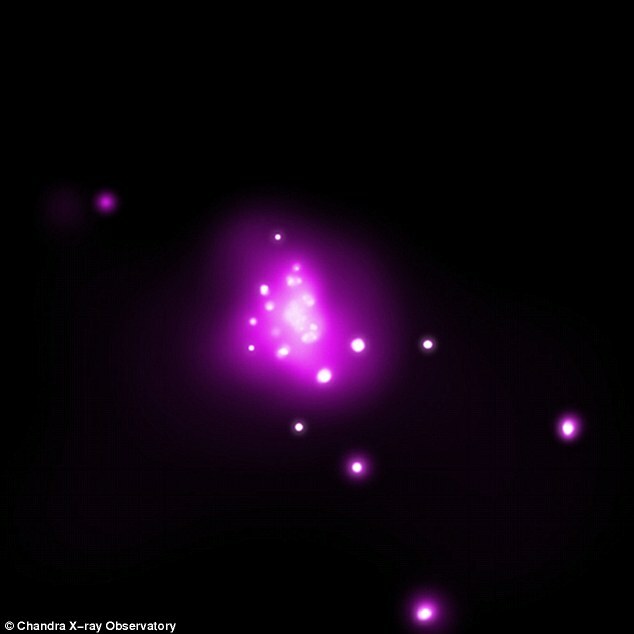 Initially, the observations had hinted that a black hole with a mass equal to at least that of several hundred suns resided at the center of that cluster, but further analysis, showed that these X-rays were produced by hot gas swirling towards an intermediate-mass black hole. Finally, after 200 days of monitoring with the X-ray telescope on board of Swift Gamma Ray Burst, the new composite image of NGC 6388 showes that these X-rays source became dimmer and dimmer over the course of the stakeout – the rate at which the X-rays dimmed consistent with a planet’s orbit being disturbed by the gravitational tidal forces of a white dwarf. In these models, a planet is first pulled away from its parent star by the gravity of the dense concentration of stars in a globular cluster. When such a planet passes too close to a white dwarf, it can be torn apart by the intense tidal forces of the white dwarf. Melania Del Santo of the National Institute for Astrophysics and colleagues from Italian institutions and University College London explained. The planetary debris is then heated and glows in X-rays as it falls onto the white dwarf. The observed amount of X-rays emitted at different energies agrees with expectations for a tidal disruption event. Scientists estimate that the doomed planet would have been about a third the size of Earth, while the white dwarf has about 1.4 times the Sun’s mass. While evidence that tidal disruption destroyed the planet is not 100% compelling, the argument for it was strengthened when scientists used data from the multiple telescopes to help rule out other possible explanations for the detected X-rays.